I watched Back to the Future series, essentially for the first time, three years ago. The series stars Michael J. Fox as Marty McFly and Christopher Lloyd as Dr. Emmett "Doc" Brown. In the first movie, Back to the Future (1985), Dr. Brown builds a time machine (1985) and Marty goes back to 1955 where he crosses paths with his parents and puts his own existence at risk. 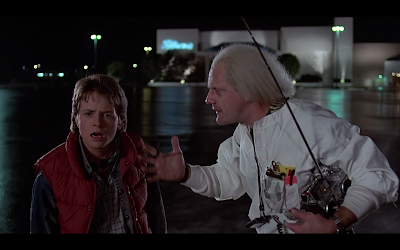 However, in addition to fixing the problem, Marty's best chance to return back to the future (1985) is during a storm when lightning strikes a clock tower. In the first sequel, Back to the Future Part II (1989), Marty goes with Dr. Brown to the future (2015) to help his future kids. While successful, future Biff ends up altering the past and so Marty goes back to 1955 to fix what future Biff has done. The second sequel, Back to the Future Part III (1989), continues where the second movie left off: Doc has been sent back to and trapped in 1885. Marty, currently in 1955, goes back in time to save Doc. While I dislike the plot holes introduced by time travel, the overall story with suspension of disbelief is fun and exciting. Want more of my thoughts and/or comments on the trilogy?